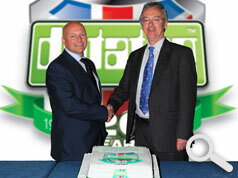 Datatag, the leader in equipment security and registration, is celebrating its 20th birthday. 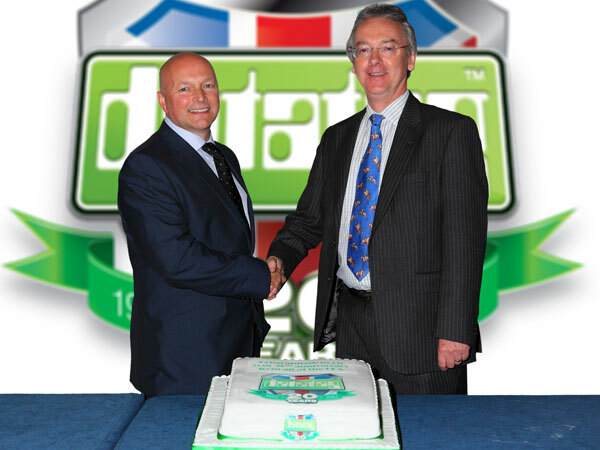 As recognition of Datatag’s contribution to equipment security Rob Oliver, Chief Executive of the Construction Equipment Association (CEA), presented Kevin Howells, MD of Datatag, with a beautiful 20th birthday cake. The presentation took place at the end of a busy morning at the CEA’s Plantworx Countdown meeting, held in Stoneleigh Park. The inaugural Plantworx construction equipment exhibition, which includes a ‘security village’, will take place in May 2013 at Stoneleigh. During its 20 year history the company has supplied millions of unique datatag's to help protect a vast range of property, equipment and vehicles of which over 90,000 are protected under the official CESAR equipment security and registration scheme which was launched by the CEA in 2007. CESAR is the most successful scheme of its type anywhere in the world. The day’s events, at Stoneleigh, included the sixth Combined Industries Theft Solutions (CITS) conference which discussed the issues surrounded the growing problem of equipment, scrap metal and fuel theft. Reflecting the importance of the issues the conference was addressed by Lord Henley, Minister for Crime Prevention from The Home Office, Kevin Howells of Datatag, DC Ian Elliot from PANIU and others. CESAR will take centre stage in the security village at Planworx in 2013 and recognising the importance of the agricultural market Datatag will be at the CEREALS exhibition, Lincoln 13-14 June, promoting the CESAR scheme.